CGR Products fabricates die-cut products of all shapes and sizes utilizing both rotary die cutting and flatbed die cutting techniques. We die-cut a wide variety of hard, soft and flexible materials, either plain or with adhesive, all uniquely designed for your specific application. These products can be supplied in continuous rolls, sheet form, or individual parts. CGR Products can die-cut products up to 48″ wide x 72″ long in a single stroke. For larger parts, we can incorporate “dove tailed” or interlocking parts. CGR can also fabricate product from the thinnest gage flexible, pliable shim materials (0.002″) up to 8″ foams. CGR Products manufactures the majority of our tooling — improving our initial lead time for customers. We also offer value-added services such as CAD reading and design, fully integrated EDI capabilities, bar coding and special labeling capabilities, along with continued an OEM Partner Program at both manufacturing locations. Rotary die cutting is a high-speed method of cutting that is very cost effective on high-volume orders. This process is superior in holding tight tolerances and offers multiple operations in a single pass. Rotary die cutting is an excellent method of producing kiss cut parts. Flatbed die cutting is ideal for kiss-cut parts or cut parts with adhesive supplied on a roll or pad. This method allows for easy hole removal and web removal from parts and quick changeover times to increase production efficiency. 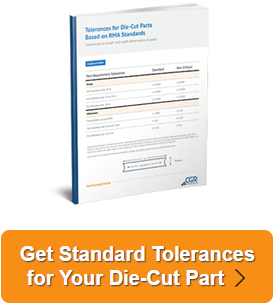 Tool and die costs are often lower with flatbed die cutting. Do you have items in stock? How soon can CGR Products ship my order? Does CGR Products take credit cards? Can CGR Products quote on specific items? Can CGR Products duplicate parts from a sample part? Can CGR Products provide me drawings? Yes, we can supply cad drawings if needed.